Here you may buy any of the following official merchandise by selecting the "ADD TO CART " button. when you are done shopping, please select the "VIEW CART" button. We use paypal. 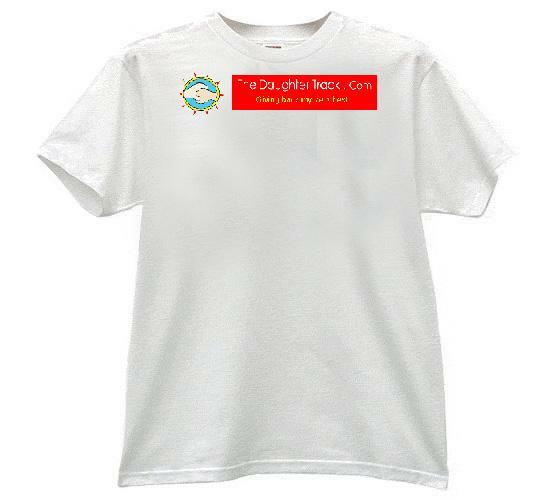 The Official Daughter Track Bumper Sticker - One size only, cost is $6.00 per sticker. Tax and postage included. Cost is $20.00 per shirt. Tax and shipping included. Monies raised by the sale of these items support a network of "Daughter Tracks" Worldwide giving voice to the milions of women who nurture life from begining to end.